My Banana Oat Cookies are healthier than usual cookies but still delicious. The kids love them! The perfect way to use up spotty bananas. 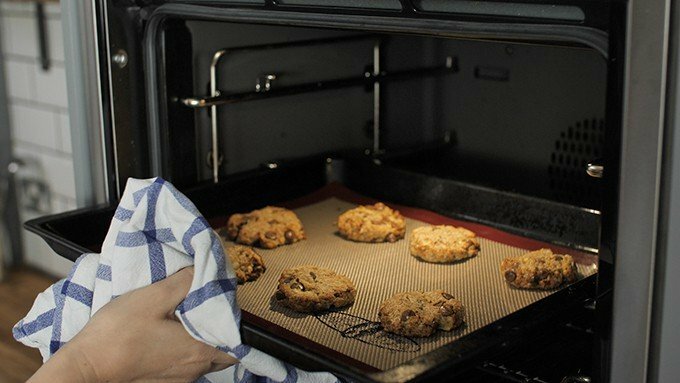 One of my earliest recipes – first written around this time 4 years ago was for these banana oat cookies. They’re such a great way to use up those leftover spotty bananas. What’s more, they’re pretty healthy too – I’ve got no qualms about letting the kids eat them for breakfast (I’m counting the chocolate chips as being good for the soul!). Six ingredients, no resting time, no flour, no eggs or butter (you could even make them vegan if you swap the chocolate chips for raisins or carob chips). 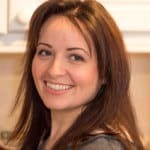 She’s appeared in a few of my recipes vids, but this time she took centre stage and made them herself. You can check out her video in my recipe card below. Lewis has also been busy in the kitchen recently. He made a delicious orange trifle for our family get together the other week, and a meatball and rice recipe last week – with just a little help from daddy. I love their little faces when we’re sat around the table eating their food (and it’s by far the easiest way to get them to eat vegetables!). 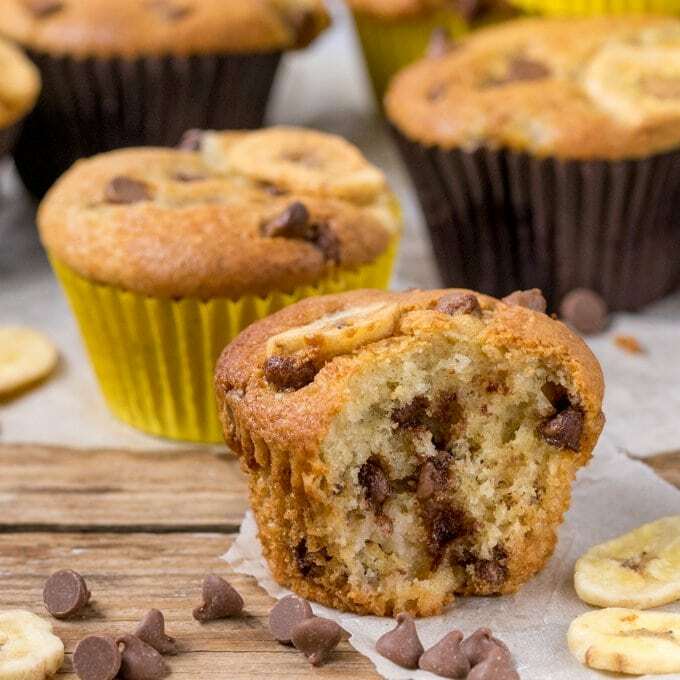 When I have a stack of spotty bananas, I often love to make banana muffins or chocolate banana bread, but the kids were getting a little too used to cake in their lunch box! These cookies are a great alternative. Healthier, but with a little chocolate chip kick so it still feels like you’re being a bit naughty. That’s breakfast sorted for tomorrow! Can I make them gluten free? Check the chocolate chips you’re using are gluten free too. Can I swap the chocolate? Yes, swap for raisins, cranberries, carob pieces, banana chips, nuts or a mixture! They last for about a two to three days wrapped in foil or baking parchment in an air-tight container at room temperature. After that they start getting softer. This recipes makes a batch of 7-8, so you shouldn’t be left with lots of cookies. They’re firm on the outside and soft and chewy in the centre. 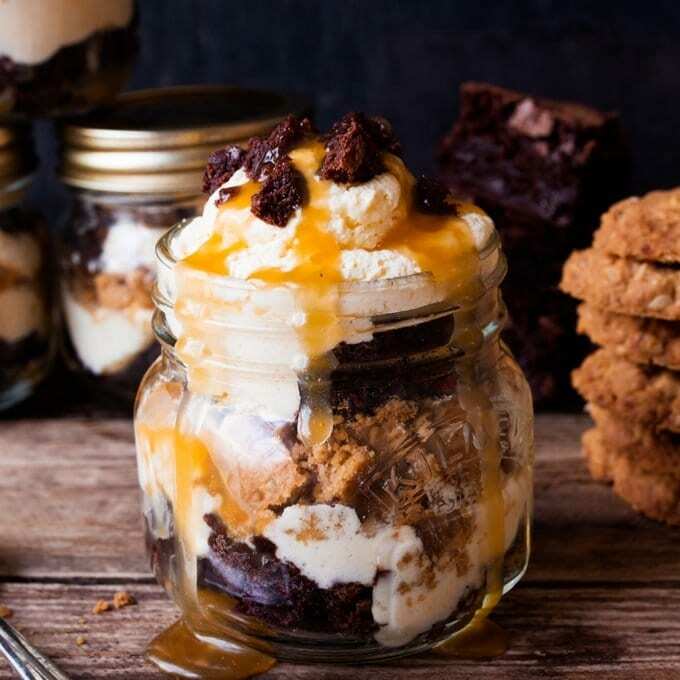 The texture comes from the chewiness of the oats – so it’s not like caramel chewy. You can bake them a little longer if you want them more crisp, but they won’t go fully crispy. 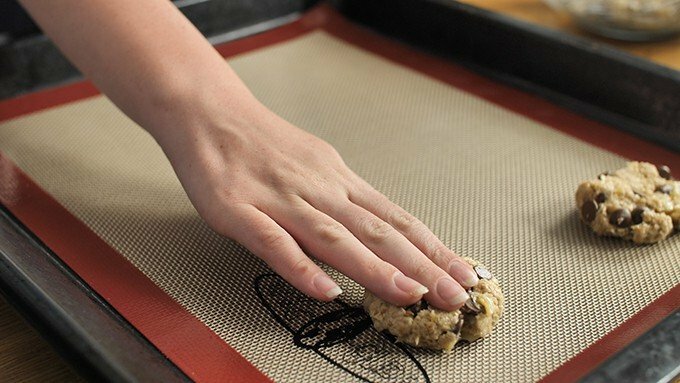 This is because the recipe only uses a little honey, rather that sugar – which makes for a crisper cookie. 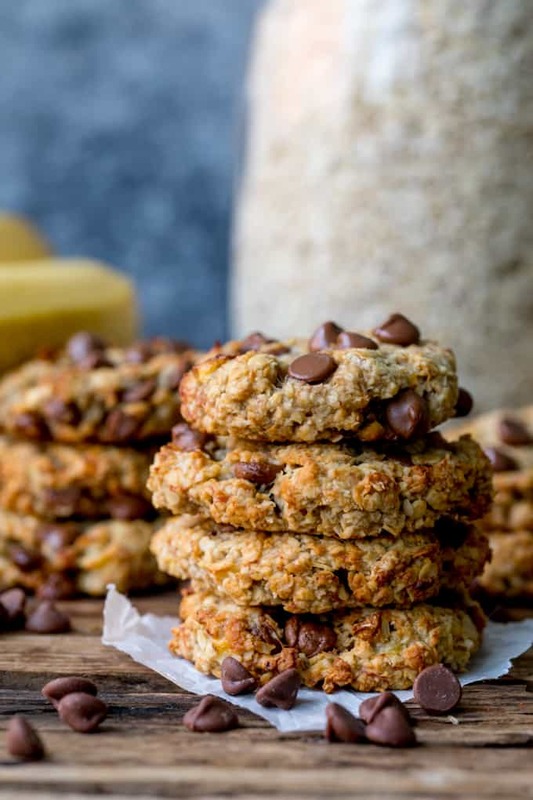 Banana Oat Cookies a great make-ahead breakfast that just happens to be gluten free. Place the banana in a medium sized bowl and mash it with a fork. Add the oats, honey and coconut oil and give everything a good stir until combined. 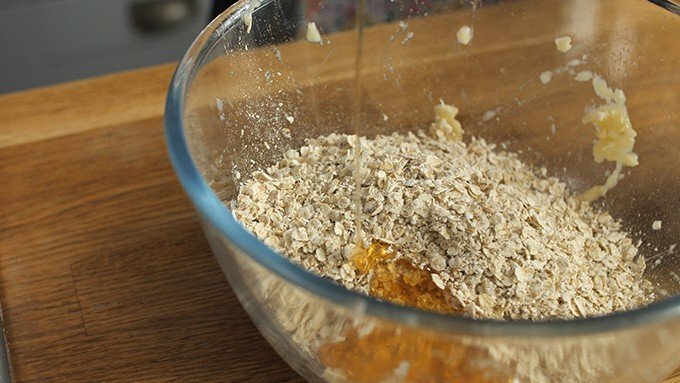 Leave to rest on the counter top for 10 minutes, so that the oats can absorb the moisture from the other ingredients. After 10 minutes, add in the chocolate chips (reserve a few to sprinkle on once the cookies are cooked) ands the salt. Stir to combine. Take a tbsp. 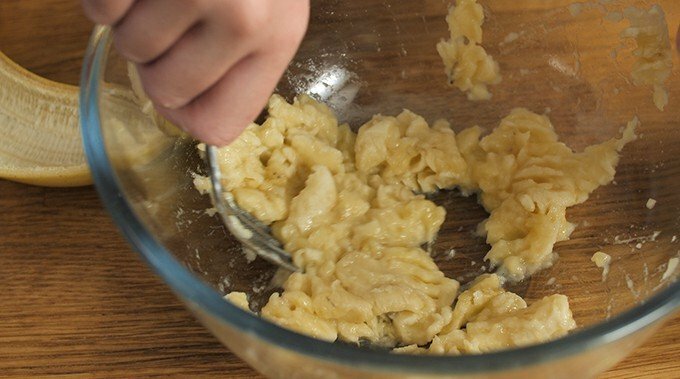 of the mixture in your hand, roll into a ball and then squash to flatten into a thick disk (approx. 1cm thick). Place on a baking tray and repeat until all your mixture is used up. 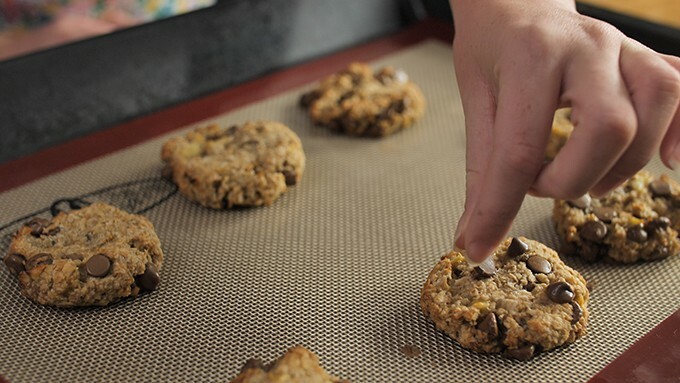 Take out of the oven, sprinkle with the reserved chocolate chips and leave to cool. Check the chocolate chips you're using are gluten free too. They last for about a two to three days wrapped in foil or baking parchment in an air-tight container at room temperature. After that they start getting softer. This recipes makes a batch of 7-8, so you shouldn't be left with lots of cookies. They're firm on the outside and soft and chewy in the centre. The texture comes from the chewiness of the oats - so it's not like caramel chewy. You can bake them a little longer if you want them more crisp, but they won't go fully crispy. This is because the recipe only uses a little honey, rather that sugar - which makes for a crisper cookie. This recipe was first published in October 2014. Updated in September 2018 with step-by-step photos, additional tips and recipe video. Thank you so much for this wonderful recipe! 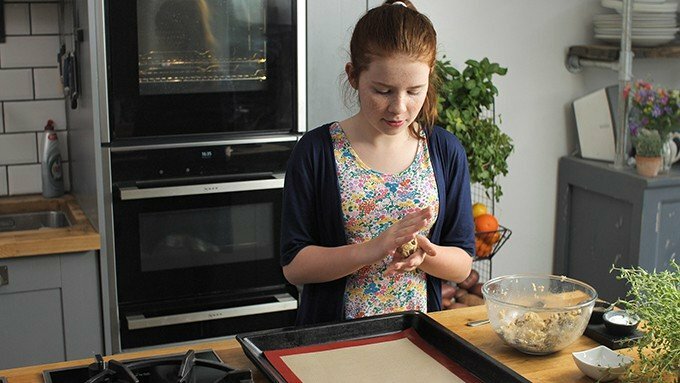 I gained 15 kg because of a stressful time and I just can’t stop eating sweets…now I am on a diet and I just made your cookies in order to satisfy my sweet tooth in a healthy way. Instead of honey I used coconut blossom sirup. I am so thrilled,the cookies taste absoutely amazing! They are crispy on the outside and soo soft on the inside,they are sweet and they are really filling. And first of all,they really satisfy my chocolate cravings! Thank you sooo much :). Hello! Thank you for this lovely recipe! I used rolled oats but i think mine are much bigger and yours, yours looks like quick cooking oats thus i can see each oat pieces very clearly unlike yours which looks like a normal flour cookie! Hence, it was just chewy all over and not just the inside! Any tips? Should i just swap to quick cooking oats? Is there any other alternative for coconut oil? Do the bananas have to be going spotty and soft or can they be fresh from the store? You can use yellow banana’s. I wouldn’t use the green banana’s as the flesh will be too hard to properly pulp up when you are mashing them. If you give them a try let me know how you get on. Hi there. Is one serving equal to 1 cookie? 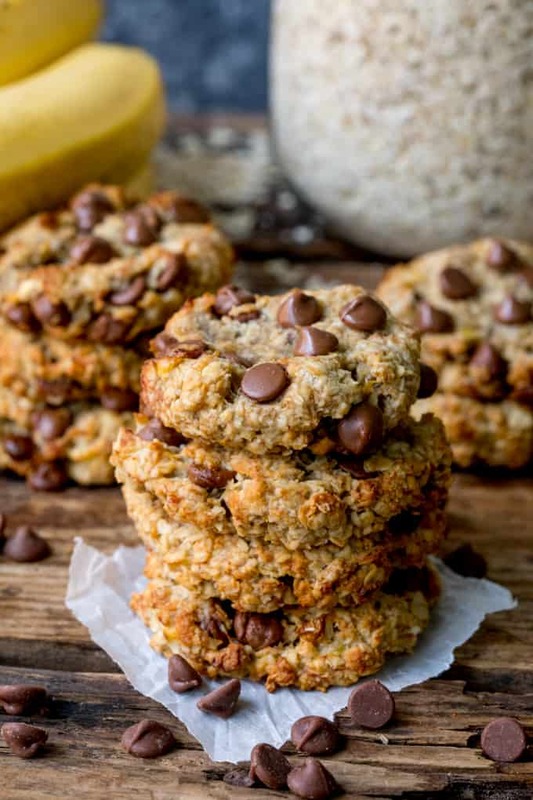 Thank you so much for sharing your banana oat and honey cookie recipe. Being a vegetarian (i don’t eat eggs either) I struggle to find healthy recipes for deserts ,These were delicious . Great recipe and nice video. Thanks very much. I only watched the video after I tried the recipe (why??? ), so instead of a quick mashing with a fork, I really creamed the banana with a wooden spoon, which made the resulting mixture really wet and sticky and hard to manage. I wouldn’t recommend this, although it did give the finished cookies quite a nice thick texture. I see a few comments below about how “healthy” these cookies are. People need to bear in mind that they are actually pretty rich. Sure, there’s no flour or eggs, but honey is a supersaturated sugar solution that comes out at around 75-80% of the calories of sugar, weight for weight. Then we have a tablespoon of saturated fat (coconut oil), and however much sugar and fat the chocolate contains. 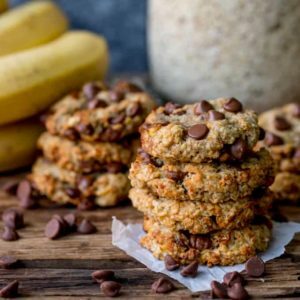 Seeing as this only makes seven small (very delicious) cookies, if you want a healthy snack, just eat the banana and oats and leave out the rest, or alternatively try two-ingredient banana-oat cookies. Anyway… The important thing was: nice recipe, great for an occasional treat. You could add 1/2 a tsp of ground cinnamon to the mix but you cant replace the honey. The Honey acts as a sweetener and binder for the cookie mixture. You can replace the coconut oil with Almond Cooking Oil or vegetable Oil.